Come join us for a Japanese Baseball Game Experience as we watch the Hanshin Tigers play, of the Nippon Professional Baseball League, at Koshien Stadium. Watching baseball in Japan is an absolute must even if you’re not necessarily a fan of the sport itself. The atmosphere with the crowd cheering, chanting and singing combined with the fascinating food options and additional entertainment make it an experience you’ll never forget. One thing we had to do in Japan, is experience a Japanese baseball game. 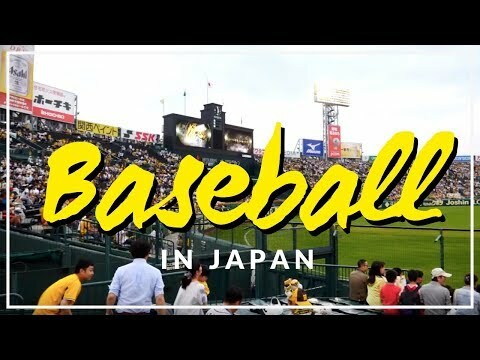 As a spectator, baseball in Japan is different – very, very different and in this video we’re going to show you a few reasons why! Good evening good evening guys. Hello hello. Today is baseball (野球) game day. It is baseball in Japan. Yeah. We’re going to be watching a Japanese Baseball Game. And it is our first time ever to do that. We are watching one of the one of two local Osaka teams. They are called the Hanshin Tigers (阪神タイガース). And we just arrived at Koshien stadium (阪神甲子園球場). As you can see I’ve already picked up a new hat. Fancy. I’m loving it and it was so easy to get our tickets. We bought them online this morning. Yes. We just had to go on and scan in with the barcode. Yeah. At a machine they spitted them out. They gave us real tickets. Yeah. And it was like I think they were it was 2,500 Yen so probably like $23 US dollars or something like that. So super affordable and we’ve also arrived with appetites so I think our first order of business is going to be to grab some food. If you’re going to support your team, you have to look the part. I picked up a Hanshin Tigers hat, but there were far more dedicated fans with really clever outfits. Woah! We’re just about to start. Next up, food. Forget popcorn and hot dogs! Japanese baseball games offer an extensive food selection at great prices. It’s good to arrive hungry! Guys check out all of the different unique things you can get here at a Japanese baseball game. There is an extensive menu. We’ve got sushi, we have fried noodles, we have octopus balls. A bit unusual but very tasty. So we got some snacks for the game. Yes. We got pizza. This is teriyaki pizza guys. Oh. And over here this one was really funny looking if I can get it open. Check out that. A hotdog pizza. Yeah. It has got a hot dog and tomatoes. Yeah. How is that pizza? It is pretty good. I’m so hungry. Wow. So tell us what have you found now? So moving on to round 2 of dessert. I have found a chocolate churros. Yes. And inside of that is an ice cream. There is whipping cream and this is uh basically a pancake. Like a crepe. A stuffed dessert. Stuffed pancake. Wow. Only at a Japanese Baseball Game. Indeed. If you want to buy beer, you wave down the ‘uriko’, which are the women who carry beer kegs on their backs. The beer at the games is surprisingly affordable too. When it comes to Japanese baseball (野球), something fascinating is that each player has their own unique song and the crowds will sing and dance when they’re up to bat. Even if you’re not a baseball fan, it’s worth attending a Japanese baseball game for the atmosphere. The game is exciting, but the crowd’s energy steals the show. Fun fact: games can end in a tie. That baseball game was a lot of fun. If you come to Japan you definitely have to go to a Japanese Baseball Game.